Here's just a small sampling of the treasures we've worked on over the years. This gorgeous Enzo has been serviced, maintained, and repaired by Taormina Imports for the past few years. 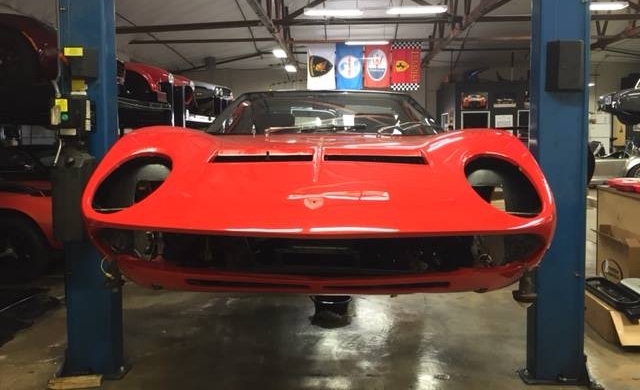 This rare Lamborghini Miura SV got a full restoration from the ground up by Taormina Imports. This Superformance Shelby Cobra, affectionately named “The Hulk”, was built by Taormina Imports for a client. It was later featured in Train’s “Drive By” music video. This other Superformance Shelby Cobra was built by Taormina Imports for another client. We just LOVE the blue upholstery on pearl white exterior! This world-record-holding Shelby Cobra, proudly named “The Italian Job”, was built by Taormina Imports, then subsequently tuned and raced by Ted Taormina himself to a world record speed of 201.1 mph in the Mojave desert, thus becoming the World’s Fastest Cobra.